When running a deployment for a given server or server group, rather than deploying straight away you can set a schedule for the deployment, either to run once in the future or for a regular set period. Within the main deployment screen you'll see an option at the bottom of the page - Schedule Deployment. The default option is set to Start immediately, with additional options displayed below. Selecting the option to Run in the future will provide a selectable date and time to schedule your deployment for. Selecting to Run Daily will present a single time option that you can set for DeployHQ to run a deployment every day. Run Weekly will show a day and time option, so that you can choose certain day of the week and a time of day to schedule this deployment to run at. The option Run Monthly will bring up a single day and a time to schedule your deployment for. In each case you'll be able to select the option to Always deploy from the last deployed commit to the latest avaialble commit which will ensure you always deploy the changes between your last deployment and the last commit pushed when the scheduled deployment starts. Otherwise, it will deploy the commits set when you first scheduled the deployment. Once you've set your desired schedule, just click the Deploy button to set it. 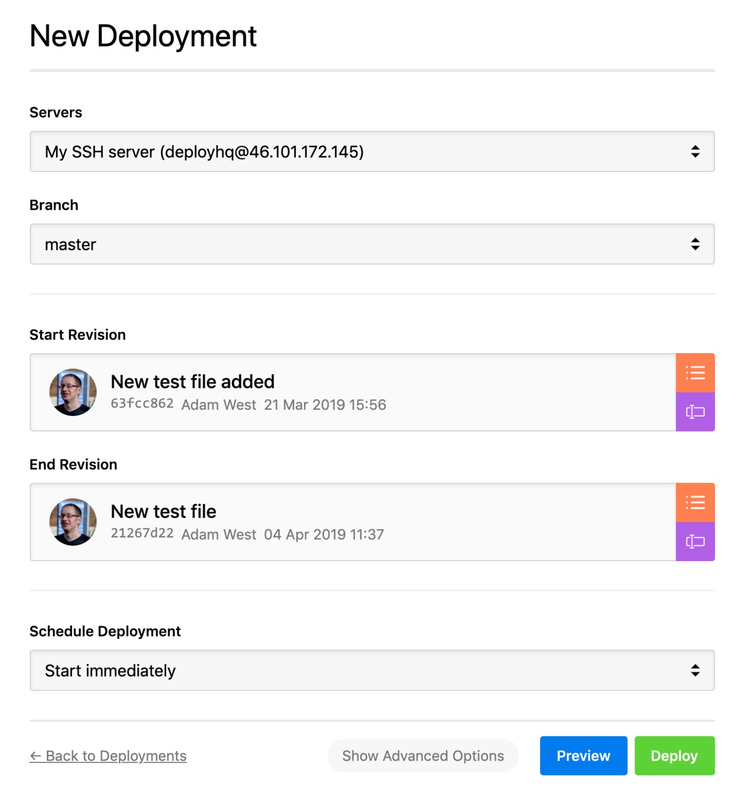 You'll now see your scheduled deployment within your overview, below the last deployment for the particular server or group that it has been set up for, with a time remaining until the next deployment displayed if it has been set to run on a regular schedule. If you need to remove this or any other schedule, simply click the delete icon next to it in your list.